Line a 9 x 9-inch baking pan with parchment paper or foil and spray with nonstick cooking spray. In large pan, melt butter over low heat. Set aside 2 cups marshmallows. Add the rest of the marshmallows to the pan and stir until completely melted. Remove pan from heat and stir in the vanilla. Gradually add crisped rice cereal and graham cracker crumbs; stirring until well coated. Fold in the reserved 1 1/2 cups of marshmallows and chocolate chips until thoroughly incorporated. Using a buttered spatula or clean hands to firmly press the mixture into the prepared pan. Cool completely. 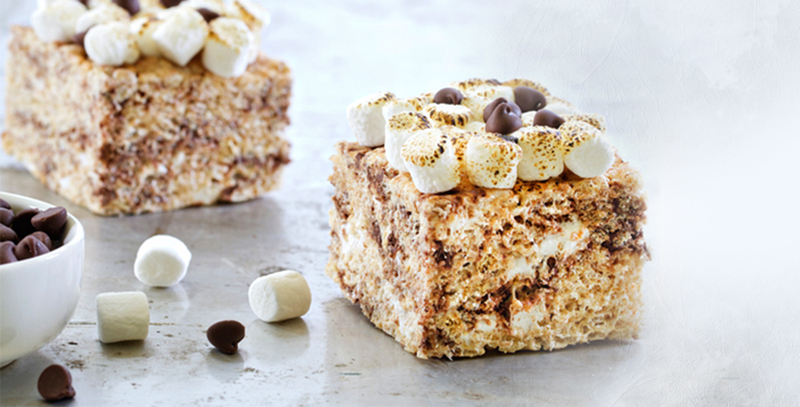 If desired, top with additional mini marshmallows and carefully use a kitchen torch to toast them just before serving. If you want the bars to be thinner, I’d suggest using a 9 x 13-inch pan instead of a 9 x 9-inch pan.